Germinates easily. Very good germination. The plants grow slow and reluctantly, however and I got 6 seedlings from 1 packet yet they all have not survived. I am in 9a, coastal southern South Carolina………..it may be the humidity here that this plant does not like. For those in warm and dry areas? Try it. These DO germinate readily. 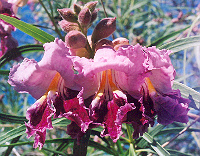 I have to say I agree with this reviewer, I think desert willow may suffer in the humid south, and does best in hot and dry climates. 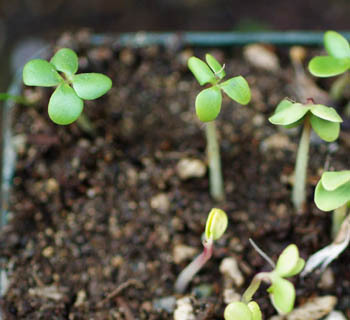 Seedlings tend to look rough and rangy until they get planted in the landscape, and even then will pause sometimes for years until they get their roots into subterranean water. At that point, they start to look good, even better when they flower. For a desert tree, I know of none as pretty. The Wood Bees love it.. as well as the Hummingbirds. Fragrance has been very light that I have noticed. It does come in different colors.. yellow, lavender, white, purple and a magenta or burgundy . Drought tplolerant, they are messy with the flower drop. I love this tree. One of my top of the list favorites.